For the past year, Stuart Mallory and Sophie Sawyer have lived and breathed Camelot’s Honor, an online multi-player game featuring King Arthur, Guinevere, Morgana, Merlin, and the many other characters from Arthurian Legend. Slaving away on menial quests, gaining experience, and rising in levels, the two tweens are obsessed with gaming. After all, life is so much easier inside the game where a person never has to worry about being cool or impressing anyone else. Also unlike junior high, there are no surprises in the game, all the fight sequences can be researched online, and a person can look and act any way he or she wants. When Sophie receives a mysterious Camelot Code on her computer, her curiosity motivates her to crack it, and she finds herself transported into the medieval days of King Arthur, where Merlin needs her help. Guinevere has dropped the Pendragon Scabbard down The Well of Dreams, and it has landed in 21st century Massachusetts. Merlin also reveals to Sophie that he has not only been playing the game with her and Stu as Melvin 01, the epic healer, but that there is more to her mother than she knows. Before Merlin can concoct a plan for Sophie to retrieve the scabbard, Arthur sees the scabbard in the Well and in reaching for it, falls in. With Arthur in the 21st century and the sword in the stone quest about to occur, they need a stand-in for Arthur—someone trustworthy and competent. Who better than Stu? In this time travel gone awry, Arthur decides he kind of likes the 21st century and doesn’t want to go back, and Stu discovers his prowess with a sword and makeshift gunpowder, becoming somewhat of a medieval rock star. 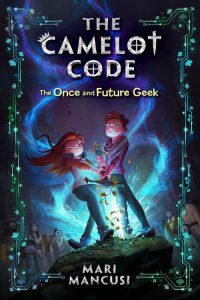 However, as the plot of The Camelot Code: The Once and Future Geek by Mari Mancusi thickens and Morgana works her hijinks, history begins to rewrite itself. Before the Saxons conquer England, Morgana becomes High Queen, Stu ends up being burned at the stake for treason, and pepperoni pizza never gets created, Sophie must set right all that has gone catawampus. Stu and Arthur eventually discover that as complicated as life might be in their old lives, those problems and conflicts are at least familiar. After all, with practice, research, and dedicated playing time, anyone can beat a video game. However, there are no do-overs, no reset-the-game options, and no wikiboards to learn the secrets of real life. Marcusi’s book not only brings the King Arthur legends into the contemporary age for middle grade readers, it also captures the challenges of junior high and the extent to which a person might go on the search for approval. And with its cliffhanger ending, Marcusi sets readers up for a sequel. Tagged Arthurian legend, friendship, online gaming. Bookmark the permalink.